Assaults on airport screeners are up 31 percent. Last year, TSA workers were physically assaulted 34 times, up from 26 in 2016, according to the agency. PORTLAND, Ore. — Grainy surveillance video shows the attack. An agitated Portland International Airport passenger grabbed an airport screener by the arm and attempted to wrestle her to the ground. Fellow passengers rushed to stop the man. They held his arms behind his back until a group of Transportation Security Administration officers arrived. Tavoloni suddenly lunged at the TSA officer, hitting him in the face. The officers quickly wrestled Tavoloni to the ground and held him until police arrived. The August 2017 incident at Portland International Airport is an example of an alarming trend at security checkpoints around the country. Assaults on airport screeners are up 31 percent. 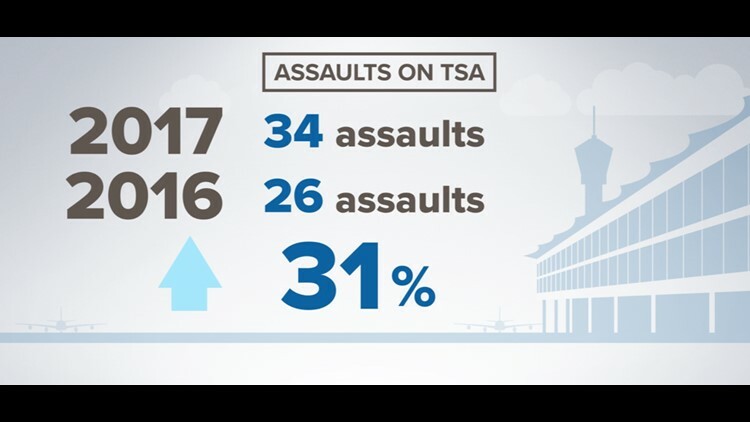 Last year, TSA workers were physically assaulted 34 times, up from 26 in 2016, according to the agency. “It is not just physical. There’s verbal abuse of the TSA officers on a regular re-occurring basis,” said J. David Cox, president of the American Federation of Government Employees, which represents airport screeners. Cox believes the actual number of assaults on airport screeners is far higher. Many confrontations go unreported. It's not clear why there are more attacks on TSA workers, although Cox suggests staffing levels could be a factor. “There are less officers which frequently causes lower morale, causes lines to be longer at airports and therefore people get frustrated because they are in lines longer,” Cox said. An internal TSA study looked at assaults on airport screeners. Using 2017 data, the agency found more than half of the attacks occurred during a pat-down or bag check. The profile of a passenger who most often assaulted a TSA officer was male, aged 41-50, according to an agency spokesperson. The TSA confirmed it has created a secret watch list to monitor certain passengers who may pose a risk to airport screeners. “There are less than 50 people on this list and the intent was, we were seeing an alarming number of assaults against our officers,” said Darby LaJoye of the TSA during a House Homeland Security Subcommittee hearing in May. The agency’s assistant administrator for security operations testified there is no additional screening for people on the watch list and they can’t be stopped from boarding flights. The TSA suggests physical attacks on airport screeners are rare, considering how many people pass through security checkpoints every day. The agency estimates there is less than one assault per 17 million passengers screened. If a passenger does become agitated during the screening process, TSA officers try to deescalate the situation. Biel would like to see armed security officers or local police at every airport checkpoint. TSA officers aren’t armed and they call local police to handle criminal matters. He believes armed law enforcement would provide TSA officers an extra layer of protection from unruly or threatening passengers. “Just the presence of an officer would defused it, immediately,” Biel said. In 2014, the TSA proposed that armed police officers help guard airport checkpoints during busy times. The recommendation came after a gunman killed TSA officer Gerardo Hernandez and wounded three others at Los Angeles International Airport. A review of the November 2014 shooting at LAX found it took several minutes for police to respond and even longer for Hernandez to receive medical care. Often passengers are the first to intervene. In April 2013, a passenger stopped an assault on a TSA officer at Honolulu International Airport. The off-duty police officer on vacation with his family jumped a security wall and tackled a female attacker to the ground. Passengers were the first to intervene during the August 2017 incident in Portland. 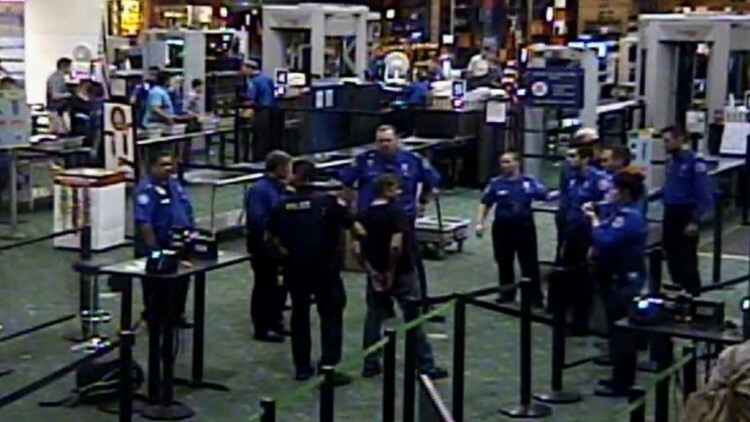 Surveillance video indicates it took two minutes for an armed Port of Portland officer to arrive at the security checkpoint. “When those events do take place there’s a lapse in time before the authorities are able to respond to a location. That should be instant,” Biel said. There are consequences for unruly, threatening or violent passengers. It can be a violation of TSA security regulations and federal law. Tavoloni, 45, of Salem, Oregon, pleaded guilty in federal court to two felony counts for assaulting the two TSA officers at PDX. He was sentenced to three years’ probation, including three months of home detention. He was not available for comment. “TSA stands behind its officers and will not tolerate assaults and threats against our employees,” said the TSA in a statement.